Space and style on Europe’s rivers. Just because you’re sailing along waterways doesn’t mean having to give up on those little touches like spas and butlers. River cruise lines are adding new features and bigger staterooms to ensure guests relax in comfort as they enjoy the sights. Despite their size, river ships can be every bit as opulent as their oceangoing cousins. With large suites, elegant furnishings, fine dining and even spas, passengers don’t have to sacrifice quality when they travel along historic waterways. The bar was raised with the introduction of Crystal River Cruises, whose ship Crystal Mozart has a spa with indoor pool, two treatment rooms and male and female saunas. It is being joined this year by Crystal Bach and Crystal Mahler, and in 2018 by Crystal Debussy and Crystal Ravel. The four new river yachts are said to be the first all-balcony, all-suite designs with every category of accommodation above the waterline. Every suite will offer butler service, king-sized beds that face towards the panoramic windows, and walk-in wardrobes in most categories. Next year Crystal Mahler will sail three seven-night routes between Budapest and Vienna and one 11-night ‘Reflections on the Danube’ voyage as well as its 16-night ‘Grand Europe’ itineraries between Amsterdam and Budapest for most of the year, cruising the Rhine and Main. Scenic has updated its river ships in the south of France with a new spa and relaxation area, including a salt lounge. Music and dimmed lighting set the scene in the natural therapy area, inspired by the microclimate of salt mines. Other treatments available on Scenic Diamond and Scenic Sapphire are aroma oil massages and river breeze facials. On the sun deck of the two ships, guests can immerse themselves in a vitality pool, sipping a drink brought by their butler and taking in the view as they enjoy the warming jets of water. There’s also a gym with treadmill, bike and weights. AmaWaterways has announced plans for its biggest-ever vessel, AmaMagna, in 2019, which will be twice the width of traditional European river ships. In a first for river cruising, it will have an open-water sports platform with Zodiac boats, canoes and other equipment. The 194 guests will have a choice of dining options, including an al fresco glass-enclosed restaurant. 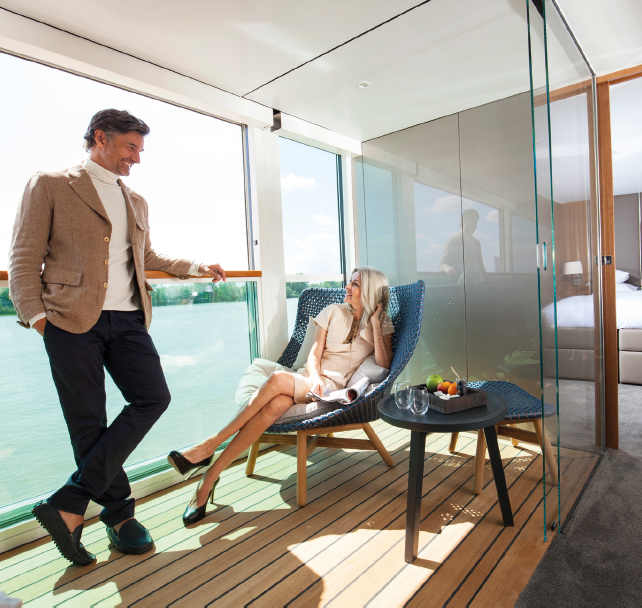 “As the luxury river cruise market continues to grow, we want to carry on as the leader in industry innovation,” said Rudi Schreiner, president and co-owner of AmaWaterways. Most of the staterooms on AmaMagna will be more than 300 square feet. A large heated sun deck will have a whirlpool and sky bar, a spa area will offer new treatments, and a fitness room will be large enough for small group classes. Active travellers can take part in cycling holidays, with many lines carrying bikes on board. Uniworld has teamed up with travel company Butterfield & Robinson to offer a new Rhine cruise next year with the chance to explore wine regions, medieval castles and UNESCO heritage sites on two wheels. The eight-day voyage, departing from Basel in Switzerland, takes in more than 1,000 kilometres of historical river bends and bike trails, including the Black Forest and Wiese Valley in Germany and the colourful foothills of the Vosges mountains in France. Daily biking excursions from the Uniworld ship Antoinette will also extend to the cities of Heidelberg, Koblenz and Cologne. Uniworld is also introducing fully inclusive river cruises on selected departures in Europe next year. Its Masterpiece Collection offers return air fares and private home-to-airport chauffeured transfers for the first time, on top of its standard included features. Bookings must be made by 30 September this year. For those who really like to go small, European Waterways offers barging trips with your own chef, cruise director and crew. Charters are available for boats, including the new addition, Spirit of Scotland, which sails the Caledonian Canal and Loch Ness. Next year it is adding to its popular culinary-themed cruises, such as on the 12-passenger L’Impressionniste on the Burgundy Canal, with exclusive tastings, visits and cooking lessons. 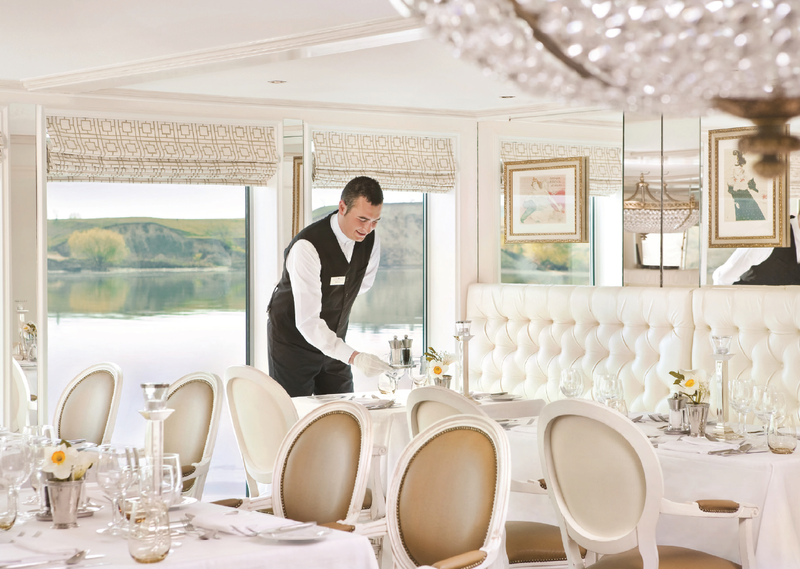 Belmond has seven luxury barges in France, with as few as four guests on board. Each night the chef serves a gourmet dinner, ending the cruise with a farewell meal of regional specialities. Shore excursions include truffle hunting, go-karting, hot air ballooning and horse-riding. Guests can sample rare vintages at a famous château or visit a market and help the chef choose fresh produce for their meals.